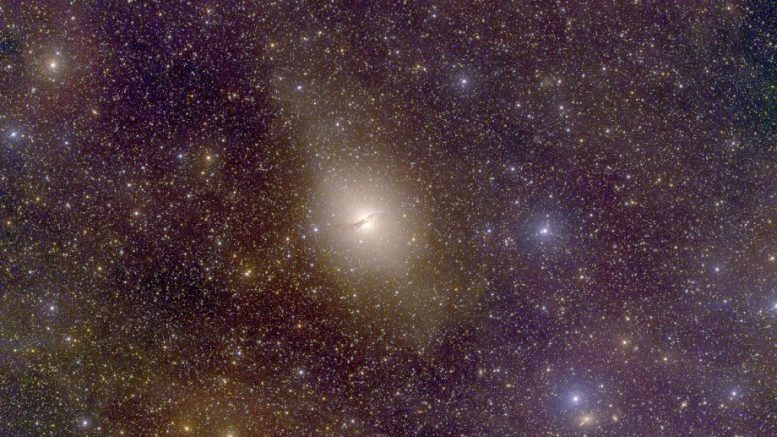 Co-researcher Associate Professor Helmut Jerjen from ANU said astronomers had previously observed planes of dwarf galaxies whirling around our galaxy, the Milky Way, and the neighbouring Andromeda. He said the latest finding challenged a long-held theory among cosmologists and theoreticians that there were thousands of dwarf galaxies in all directions around these large galaxies like bees swarming around a hive. Dr Jerjen said dwarf galaxies were distributed in planes that were almost perpendicular to the disks of the Milky Way, Andromeda and Centaurus A. “Even the best cosmological simulations struggle to explain the phenomenon of these small galaxies revolving in one direction around host galaxies,” he said. Dr Jerjen conducted the study in collaboration with Dr Oliver Müller from the University of Basel in Switzerland, Dr Marcel Pawlowski from the University of California, Irvine, in the United States and Dr Federico Lelli from the European Southern Observatory in Germany. Dr Müller said it was likely most large galaxies in the Universe have had a close encounter or merged with another galaxy at least once in their life. “Co-rotating dwarf galaxy systems could have formed during such interactions. In this scenario dwarf galaxies should be devoid of dark matter,” he said. The Milky Way and Andromeda are spiral galaxies, while Centaurus A has both elliptical and spiral features. Centaurus A is about 13 million light years away from Earth. The most well-known dwarf galaxies around the Milky Way are the Magellanic Clouds, which are visible to the naked eye from the southern hemisphere. Dr Jerjen said the latest research will have major implications for future cosmological work. Be the first to comment on "New Discovery Challenges Popular Theory About Dwarf Galaxies"